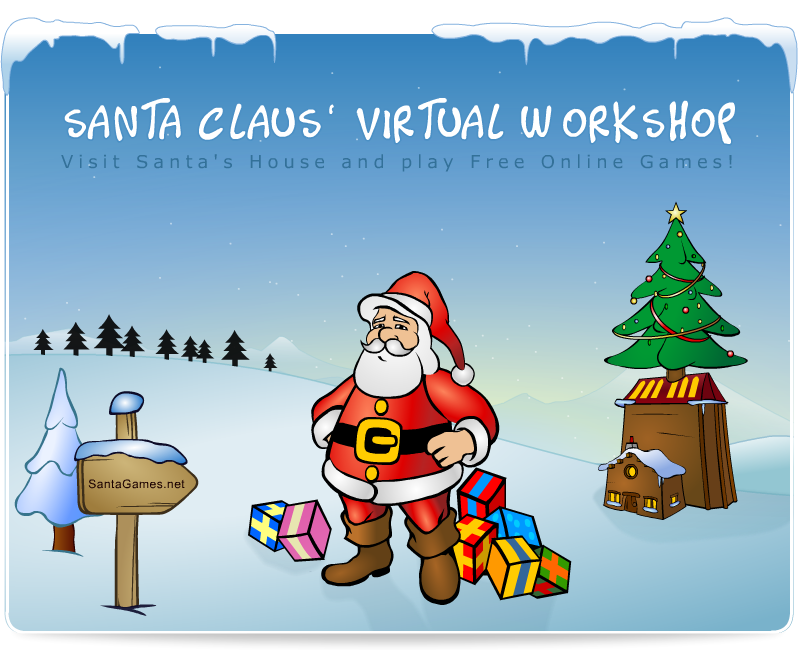 Welcome to Santa Claus' Virtual Workshop! Christmas is coming and you can hardly wait a minute longer! You’re watching out for that first flake of snow to fall as you hum festive tunes even as the wind whistles and howls through the tall pine trees…Your eyes shine and sparkle like the fairy lights which send their cheerful rays out into the darkness of the night and your ears tingle as soon as you hear the tinkling of little bells. You dance for joy at the thought of draping the Christmas tree with tinsel and colourful baubles – not to mention being able to put the wonderfully wrapped and be-ribboned gifts you’ve bought under the tree – and receiving the ones that are for you! To get right into the magical spirit of Christmas without further ado, why not take a look at Father Christmas’s workshop, his festive activities and interactive games on SantaGames.net ! On SantaGames.net, you can visit Father Christmas’ house – it’s almost like being there yourself! This amazing place is full of wonderful, sparkling surprise upon surprise which will whisk you into the magical world of Christmas! Maybe you’ll pluck up the courage to push open the kitchen door, where you’ll find lots of delicious recipes? Will you go up the stairway to the office, where you can see all of Father Christmas’ secrets and read some wonderful Christmas stories? You might like to take the lift to the games room or the elves’ workshop to enjoy playing some great Christmas games with them. Perhaps you’ll stay in Father Christmas’ living room to help him decorate the Christmas tree? Maybe you’ll head outside and make yourself a fantastic snowman? In Father Christmas’ house, you can do whatever you want! From the 1st December on, you can open a window of the magical Advent Calendar hanging above Father Christmas’ fireplace every day until the long-awaited date of December 25th finally comes round! , , and until Christmas 2017!